Note: Since only three tropical cyclones necessitated the #10 Hurricane Signal since 1986, the following percentile ranks are obtained taking all tropical cyclones necessitating at least the #3 Strong Wind Signal into account. HATO developed within the intertropical convergence zone in middle to late August. On August 19, the JTWC issued a tropical cyclone formation alert for the patch of active convections just east of the Luzon Strait. The low pressure system intensified into a tropical depression on August 20; the JTWC made the upgrade at 8 am and assigned to it the storm number 15W, while the HKO upgraded the system near noon that day. The JMA, meanwhile, upgraded 15W into a tropical storm at 2 pm and named it HATO. At its formation, HATO was situated in warm seas but with moderate westerly vertical wind shear. As a result, HATO's convections were concentrated in its western semicircle and its low-level circulation centre was exposed. Numerical models and some official agencies predicted that HATO would initially move west or dip southward briefly as the storm organized itself. Later, as the subtropical ridge north of HATO assumed influence, the storm would then move west-northwest towards eastern Guangdong. Over the next two days, HATO intensified slowly but steadily. It crossed the Luzon Strait on August 21 and entered the South China Sea early on August 22, still moving west. 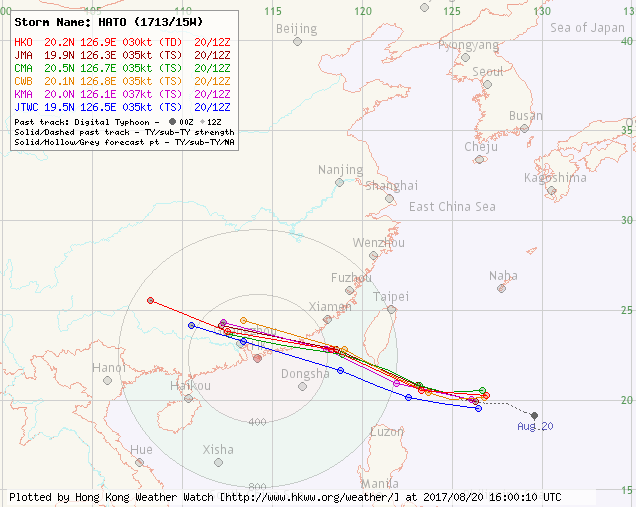 All official agencies adjusted their track forecast westward to depict a landfall just west of Hong Kong, on the other side of the Pearl River Estuary. 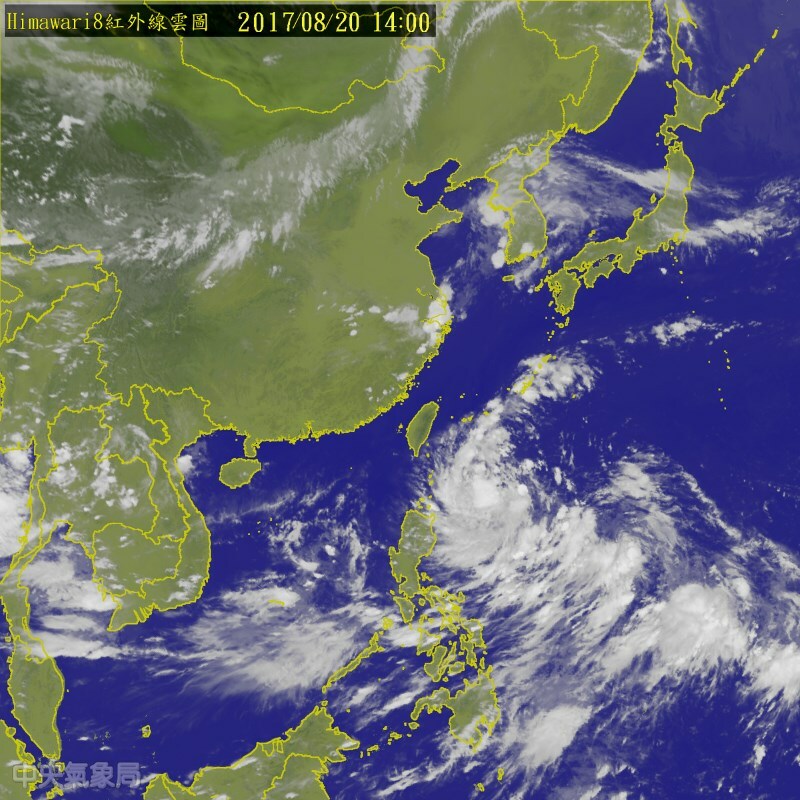 The vertical wind shear in northeastern South China Sea eased on August 22 and HATO was able to accumulate convections near its centre. The HKO upgraded HATO into a severe tropical storm at noon, and the storm intensified into a 110-km/h system in the early afternoon. 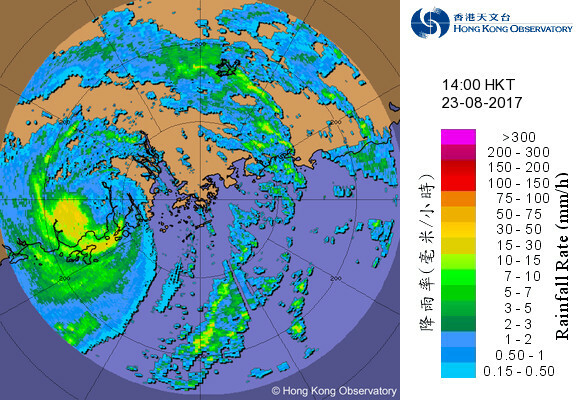 HATO further developed a banding eye shortly after and the HKO made another upgrade at 4 pm, declaring HATO a typhoon. 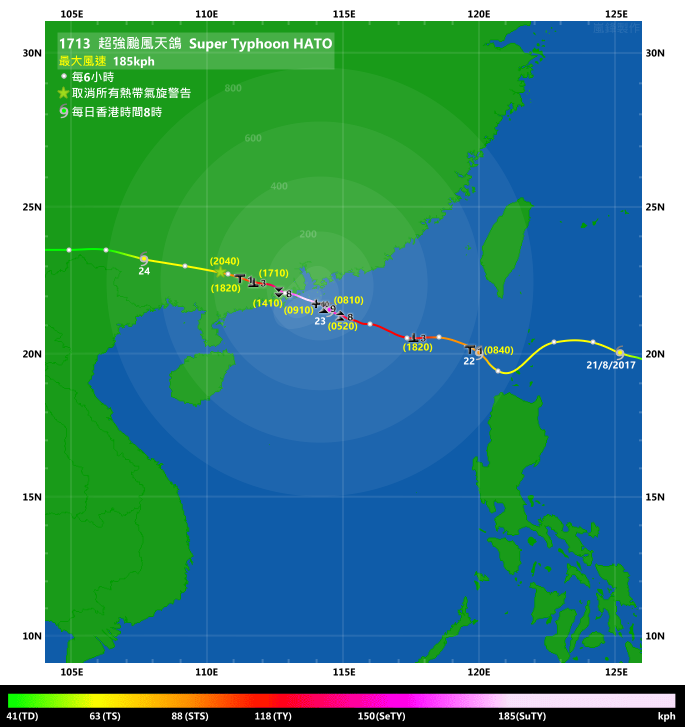 HATO started to move west-northwest in the night of August 22 and approached Dongsha near midnight August 23. The storm continued to strengthen in very warm seas and developed a small central dense overcast in the morning. 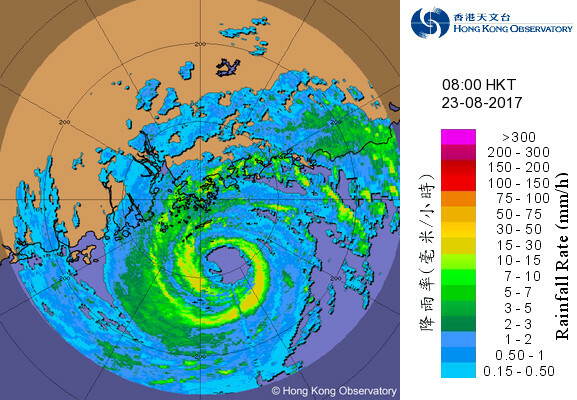 The NMC of the CMA upgraded HATO into a severe typhoon at 7 am and the HKO followed suit an hour later. 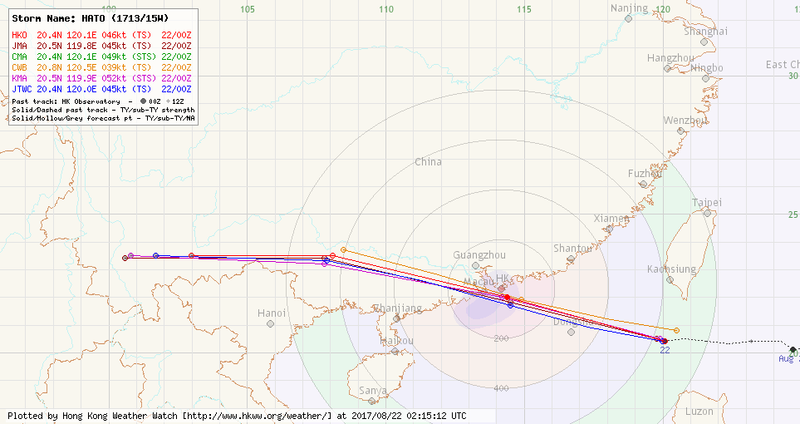 The storm was almost at its peak strength when it passed around 60 km south-southwest of the Hong Kong Observatory near 10 am*. 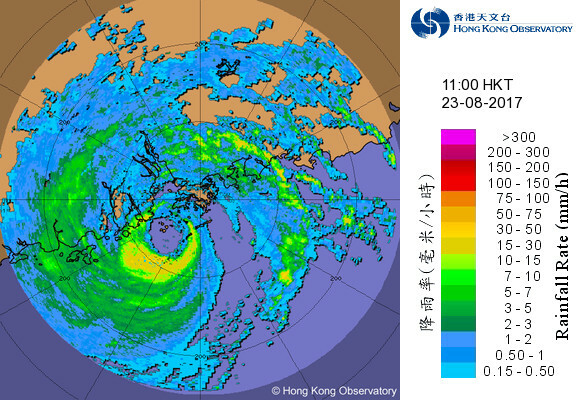 HATO's northern eyewall and part of its eye battered Macau near noon and made landfall at Zhuhai just west of Macau at 1 pm, carrying winds of up to 175 km/h (HKO estimate**). HATO continued to move west-northwest after landfall. 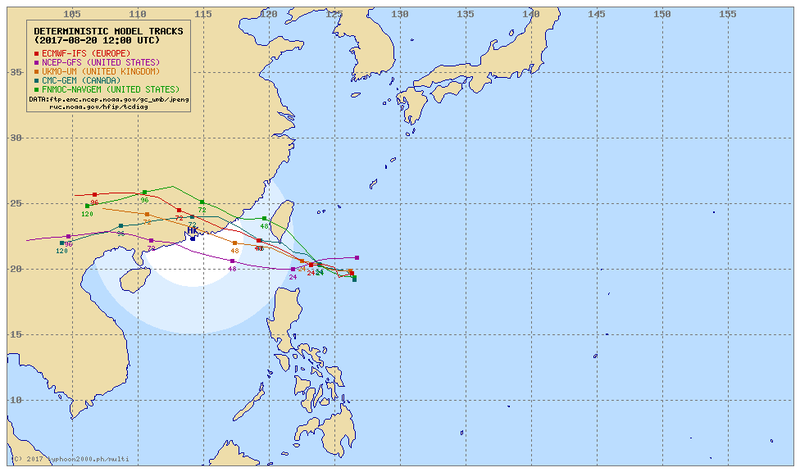 It weakened into a typhoon at 4 pm and further into a severe tropical storm at 7 pm. 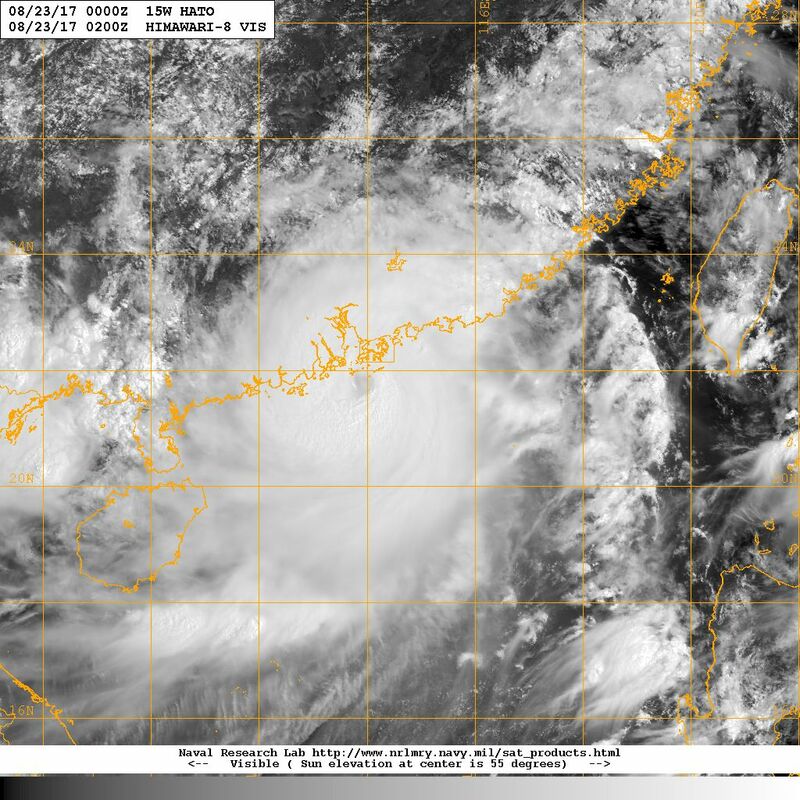 The storm moved into Guangxi later that night and remained as a tropical storm throughout the morning of August 24. It finally weakened into an area of low pressure near midnight August 25 in southern Yunnan province. 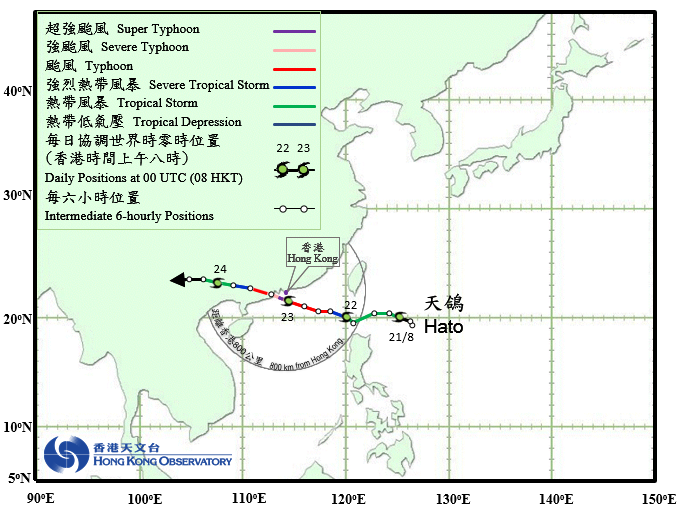 *The HKO later revised HATO's maximum intensity to 185 km/h (super typhoon category) in its tropical cyclone report. **Estimates from other agencies are: SMG 165 km/h, NMC 48 m/s (173 km/h) 2-min average, JMA 80 knots (148 km/h), CWB 40 m/s (144 km/h), JTWC 100 knots (185 km/h) 1-min average. 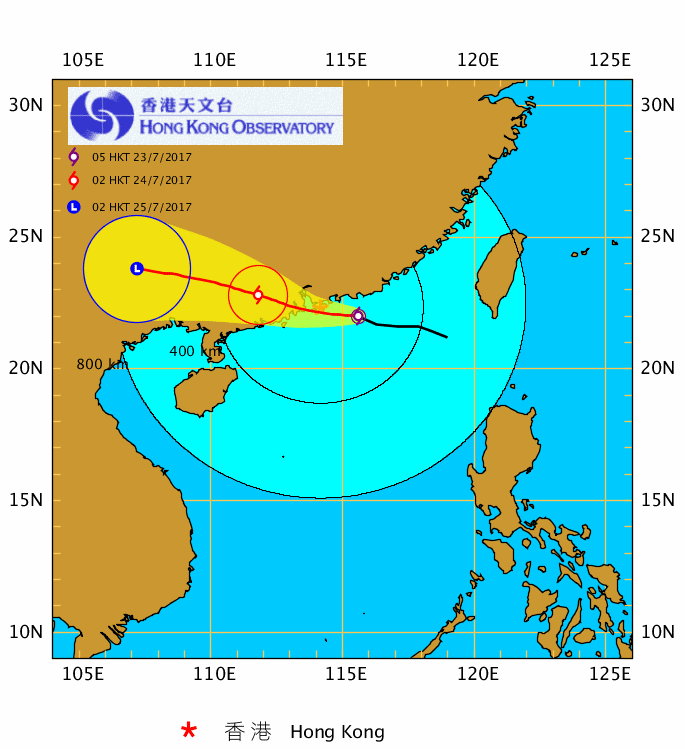 HATO becomes the first tropical cyclone since Typhoon VICENTE in 2012 to necessitate the #10 Hurricane Signal in Hong Kong. 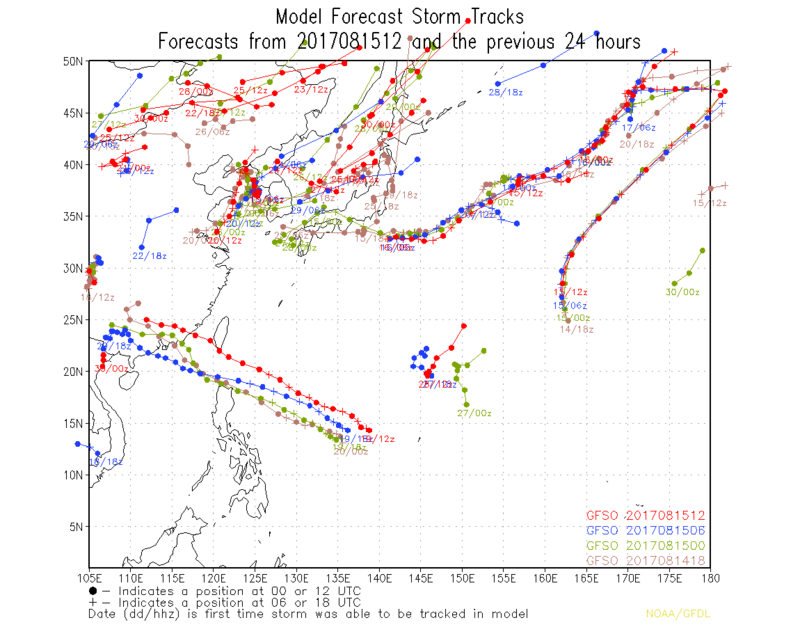 Even before HATO's formation, numerical models had been suggesting the formation of a tropical cyclone east of the Philippines with landfall in southern China. Under the influence of the subtropical ridge, it was mainly sunny on August 21 and 22. HATO entered the South China Sea in the morning of August 22; the #1 Standby Signal was issued at 8:40 am when HATO was around 650 km east-southeast of Hong Kong. 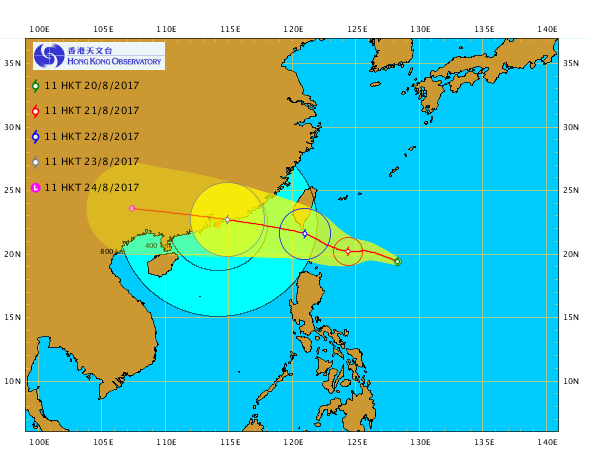 As soon as the signal was issued, the HKO had already warned that HATO might pass within 100 km of the territory the next morning, and that the #3 Signal would be considered in the evening. 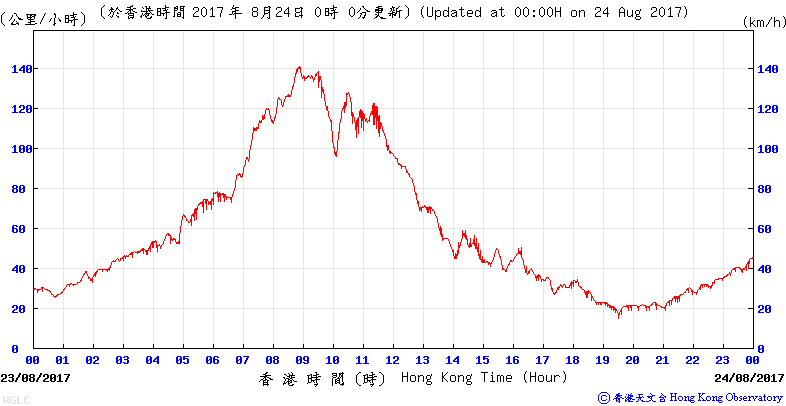 Due to HATO's subsidence, winds were light and it was very hot on August 22. 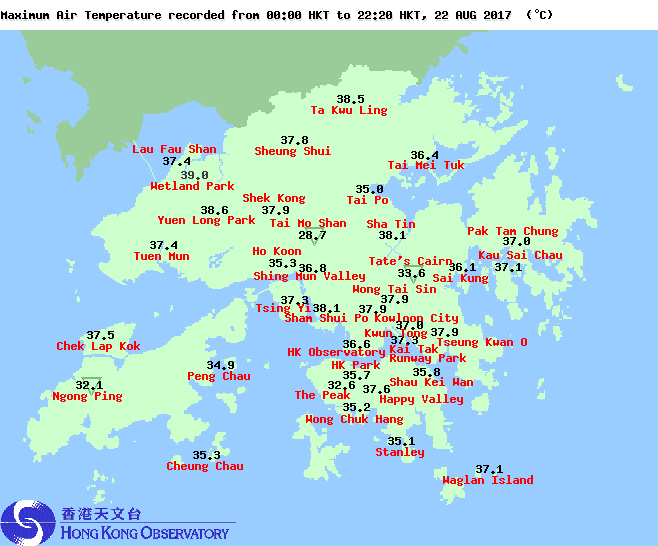 Many places saw a surge in the air temperature to above 37 degrees in the afternoon; a maximum of 36.6 degrees was recorded at the Observatory at around 2 pm, breaking the previous record high of 36.3 degrees set in 2015. The temperature at Wetland Park even reached 39.0 degrees. Convective activities triggered by the extreme heat resulted in heavy showers across the territory near 4 pm, bringing down the temperature by more than 10 degrees at several locations. The HKO issued the #3 Strong Wind Signal at 6:20 pm when HATO was around 410 km to the east-southeast, and mentioned that the #8 Signal would be considered near midnight unless HATO weakened or moved further away than forecast. Cargo handling services were suspended at around 7 pm. Locally, winds turned north but remained weak at nighttime. 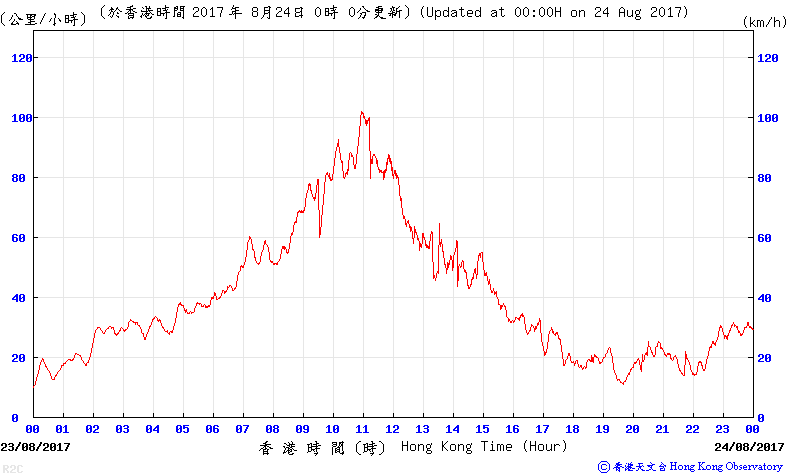 As a result, the HKO pushed back its timeframe for issuing a higher signal to the small hours of August 23, and later further to before 6 am. 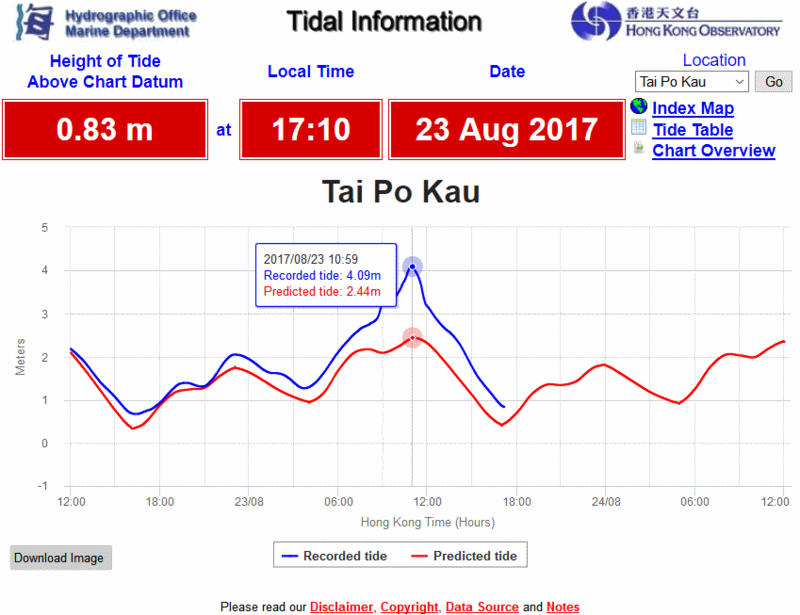 Also, as it was close to the date of the new moon and HATO was expected to approach during high tide, the HKO also warned the public about the possibility of serious flooding in low-lying areas due to the storm surge brought by HATO, and that the water level could be over 1 metre above normal. HATO's circulation entered HKO's 256-km radar near midnight August 23, and it became apparent that HATO's eye was tightening over time. 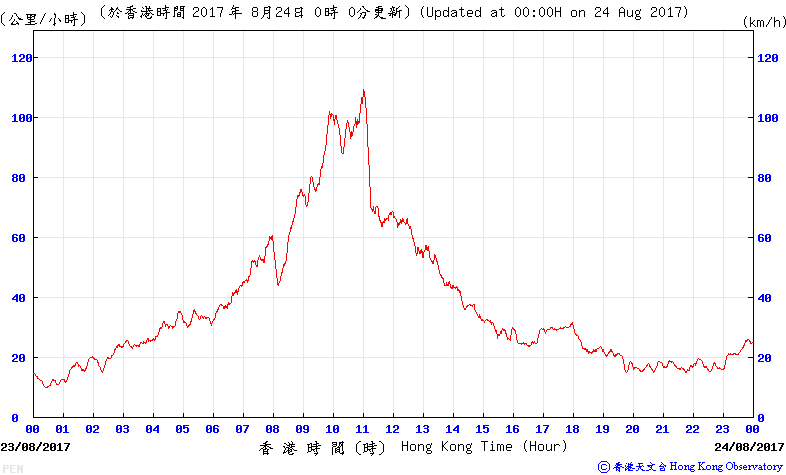 The HKO issued the Pre-No. 8 Special Announcement at 3:20 am and indicated that the #8 Signal would be issued by 5:30 am. Although HATO was only 220 km from Hong Kong at that time, winds were still quite light over the territory due to the sheltering effect of northerly winds, except at Tate's Cairn and Waglan Island where strong winds were being observed. 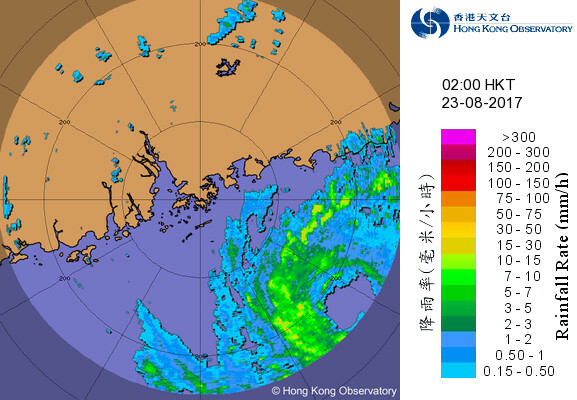 HATO's outer rainbands arrived at Hong Kong near 4 am and winds picked up at most offshore and highground locations at this time. 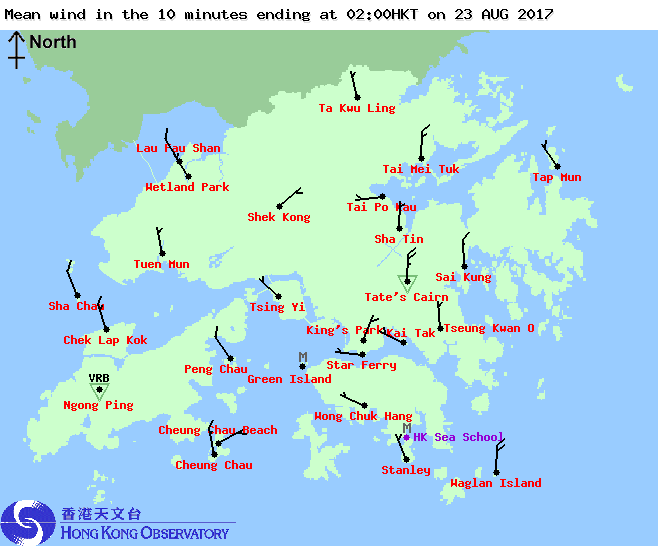 At 5:20 am, the HKO issued the #8 Northeast Gale or Storm Signal. HATO was situated around 180 km southeast of Hong Kong and continued to approach the territory; chances of issuing higher signals could not be ruled out. Jetfoil services between Hong Kong and Macau were suspended, and so were most other land and sea transport services within the territory. Winds strengthened rapidly after daybreak, with storm force winds blowing at Tate's Cairn and Waglan Island by 7 am, and places such as Cheung Chau, Sai Kung, Sha Chau started to register gale force winds near 8 am. 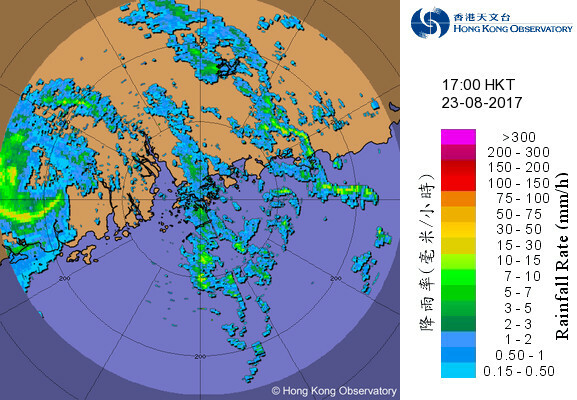 As an inner rainband swept across Hong Kong in the morning, the HKO issued the Amber Rainstorm Warning at 8 am. 10 minutes later, the #9 Increasing Gale or Storm Signal was issued, together with an upgrade of HATO into a severe typhoon. 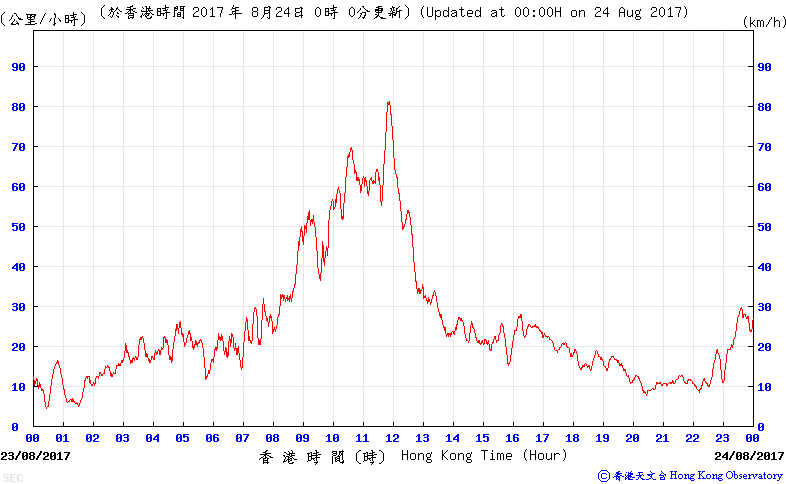 HATO was only about 100 km from the Observatory and winds were still surging. 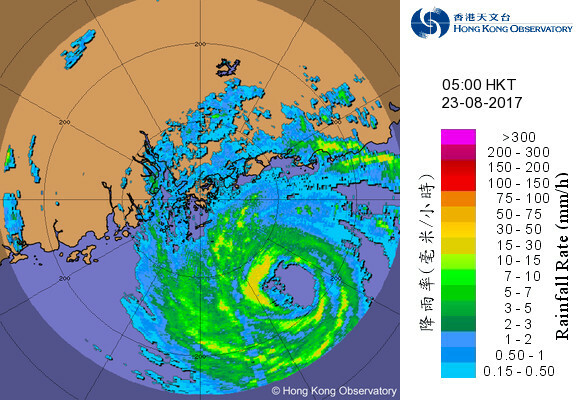 By 9 am, hurricane force winds were recorded at Tate's Cairn and Waglan Island, while winds at Cheung Chau reached storm force and was close to the hurricane force threshold. 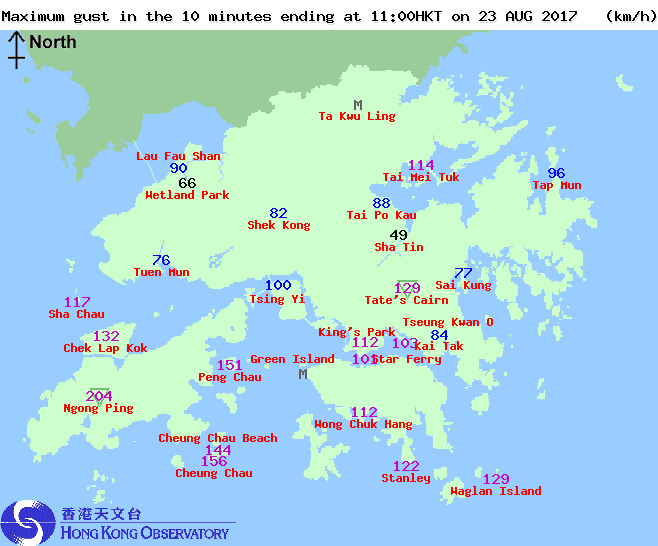 The HKO issued the #10 Hurricane Signal at 9:10 am; in Hong Kong, the strongest winds were generally recorded between 9 am and noon, with hurricane force winds also observed at Cheung Chau and Ngong Ping, and storm force winds at Chek Lap Kok, Tai Mei Tuk, Peng Chau, Sha Chau, Stanley and Tap Mun. Gales were widespread in other places. 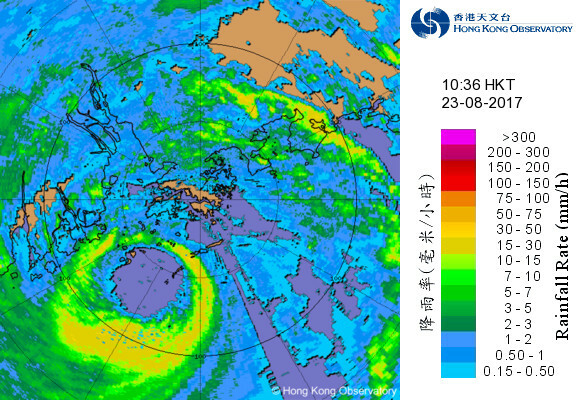 HATO was closest to Hong Kong at around 10 am. As HATO moved to the southwest, local wind direction gradually changed from northeast to southeast between 10 and 11 am. 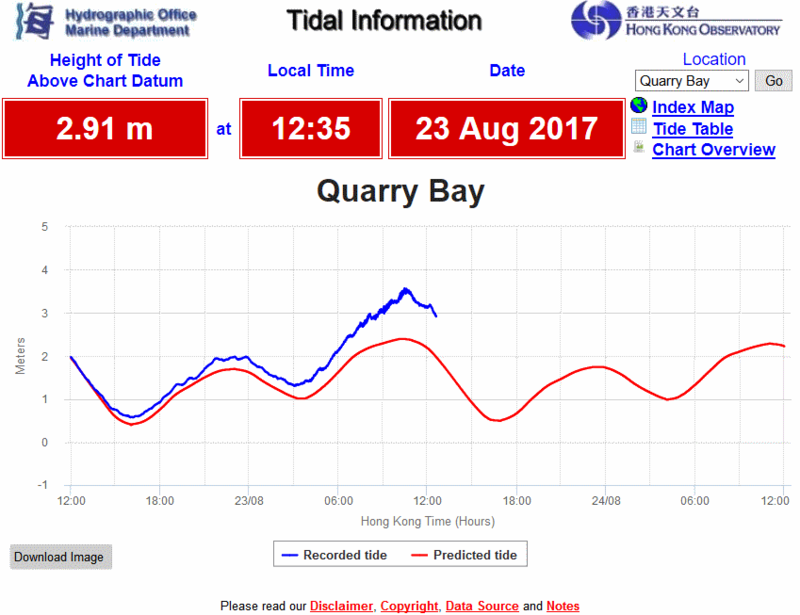 This coincided with the high tide that morning and resulted in exceptionally high water levels - the water level of 4.09 m above the Chart Datum recorded at 10:59 am at Tai Po Kau was the highest since Typhoon HOPE in 1979, and the level 3.57 m at about 10:29 am at Quarry Bay was the highest since Typhoon WANDA in 1962. 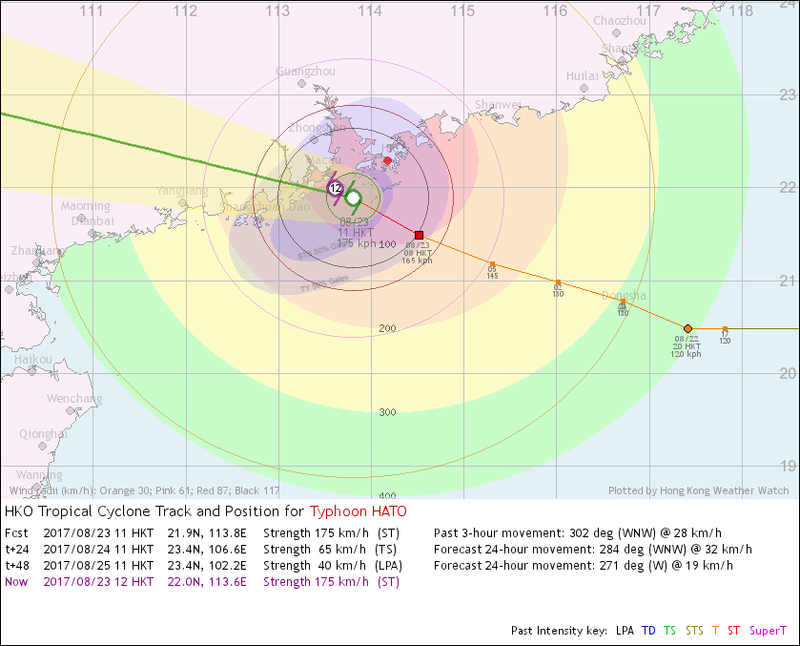 As HATO moved to south of Macau and made landfall at Zhuhai, winds in Hong Kong weakened sharply near noon. 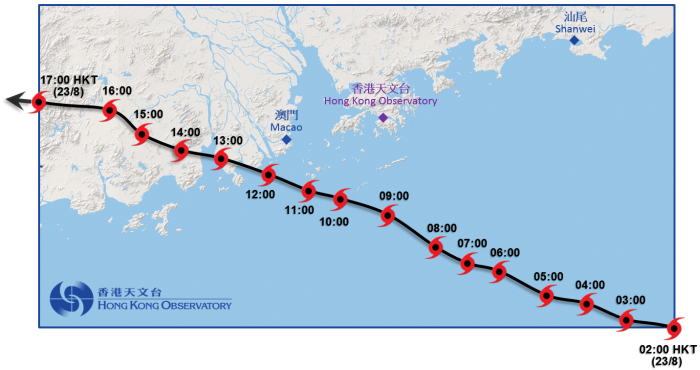 The HKO replaced the #10 Signal by the #8 Southeast Gale or Storm Signal at 2:10 pm, after HATO had made landfall at Zhuhai and when HATO was about 110 km west of Hong Kong. By that time, gales were only confined to offshore and highground areas. 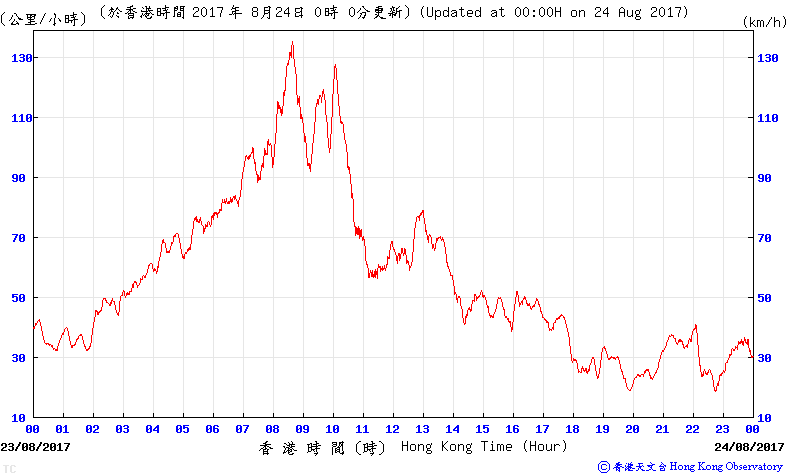 Following the change in signal, the MTR service (previously restricted to underground sections) resumed gradually. Winds eased further during the afternoon, prompting the HKO to issue the #3 Strong Wind Signal at 5:10 pm and later the #1 Standby Signal at 6:20 pm. The #1 Signal was eventually cancelled at 8:40 pm. As HATO's rainbands were concentrated in its southern side and convective activities were sparse after its passage, the weather improved quickly and there were sunny periods the day after. 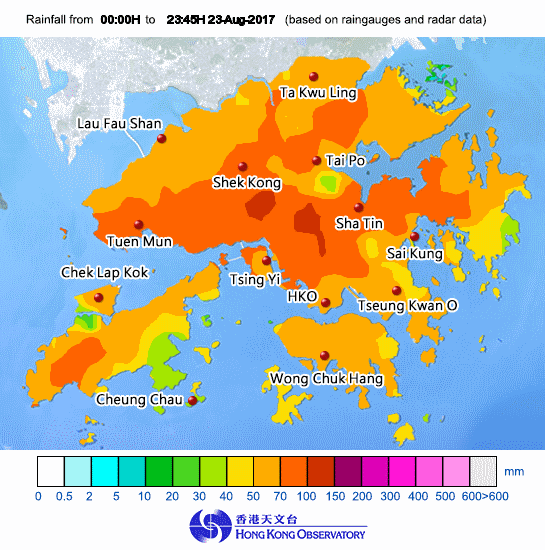 The most serious damage in Hong Kong during HATO's passage is related to the surging water level. An underground car park in Heng Fa Chuen was submerged in water as series of waves beat the barrier; low-lying areas such as Tai O and Lei Yue Mun were hit hard, while the cycling lanes surrounding the Shing Mun River in Shatin briefly turned underwater. Glass panels mounted on various building were broken; the windows of several lower-floor units of a residential building in Hung Hom were broken by an outdoor working platform that was blown loose and was allowed to swing freely. According to the government's report, more than 120 people were injured during HATO's approach and sought medical assistance in the emergency units of public hospitals. More than 480 flights were cancelled and there were about 700 reports of fallen trees. 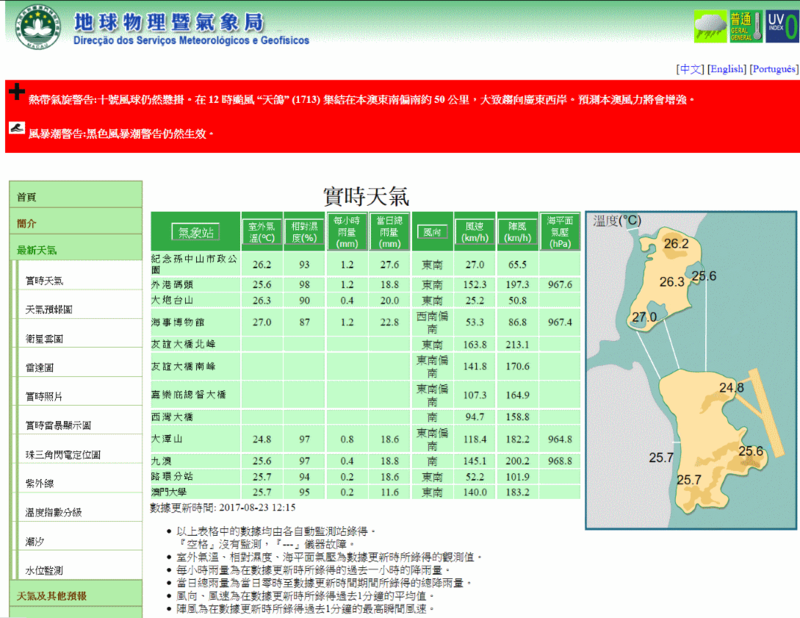 On the other hand, Macau hoisted the first #10 Hurricane Signal since Typhoon YORK in 1999. 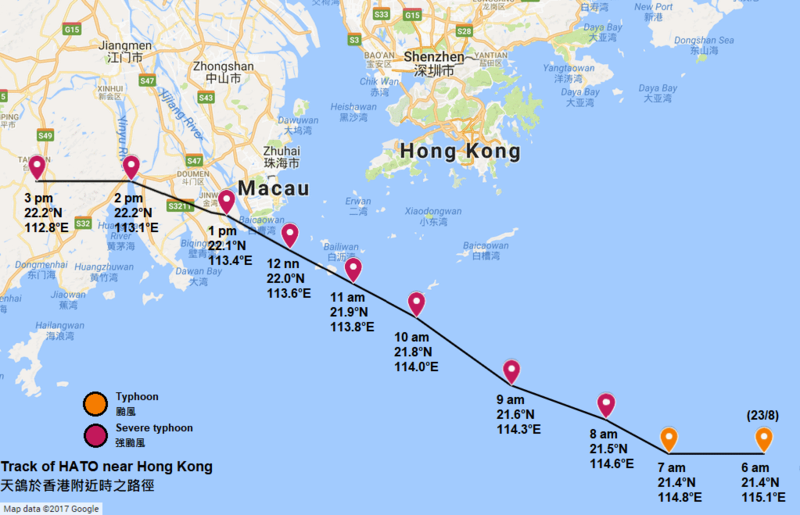 Macau suffered much more serious damage as it was exposed to HATO's even stronger winds within its inner eyewall, with 1-minute sustained winds in excess of 160 km/h recorded at the Amizade Bridge. 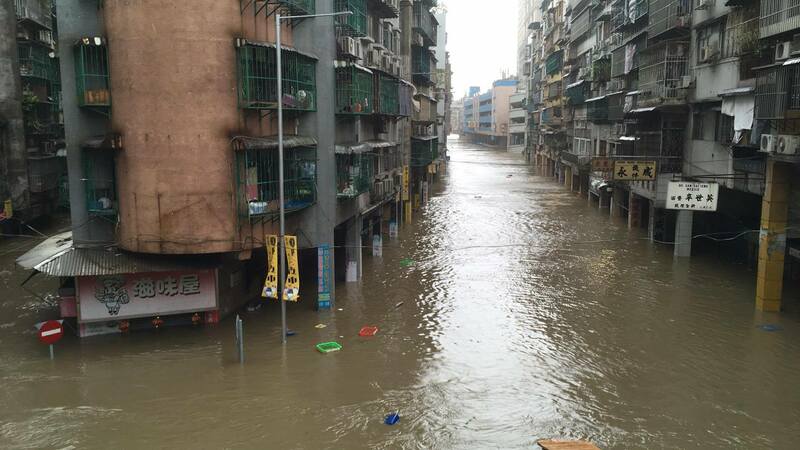 Low-lying areas in Macau's western side such as St. Lawrence's Parish were inundated and many underground car parks were submerged. The storm resulted in 10 deaths in Macau and much of the city was incapacitated by the disruption of power and water supply. The SMG was criticised for failing to provide adequate warning of the impending danger and the relatively late issuance of tropical cyclone warning signals. Its director, Mr. Fong Soi Kun, resigned on August 24 due to personal reasons. Figure 1 - The predictions of the numerical forecast model GFS on August 15. A close approach had been in the forecast long before HATO formed. 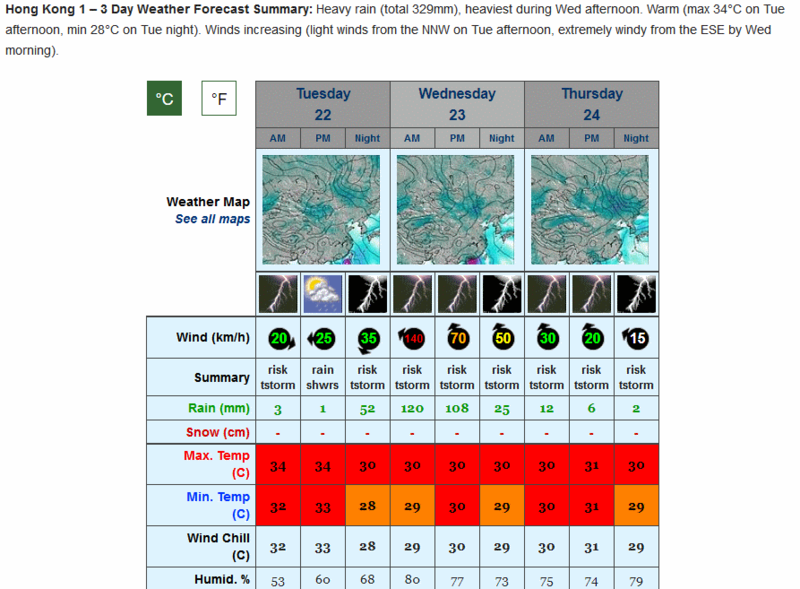 Figure 7 - Screenshot from weather-forecast.com on August 22. Based on the GFS model, hurricane force winds of up to 140 km/h during the morning of August 23 were in the forecast. 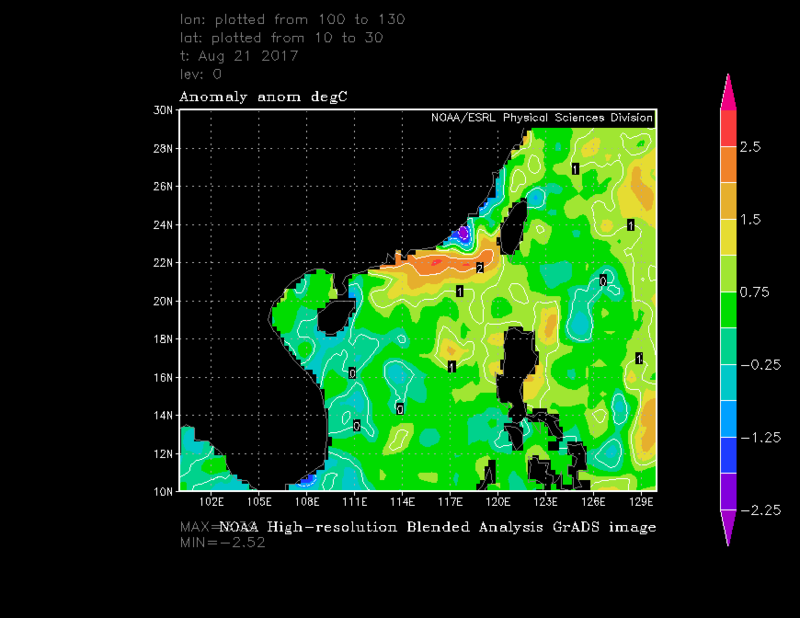 Figure 9 - Sea temperature anomaly on August 21. 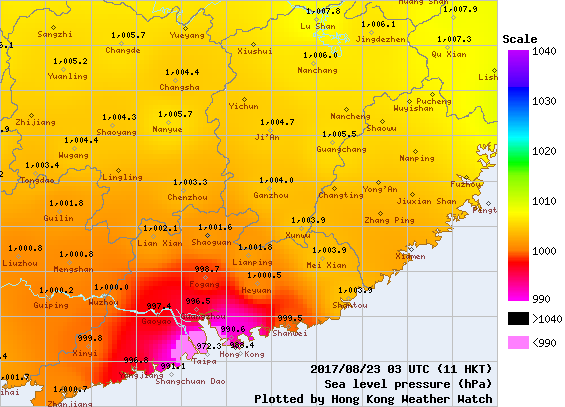 The exceptionally warm seas east of Hong Kong were thought to contribute to HATO's rapid intensification prior to landfall. 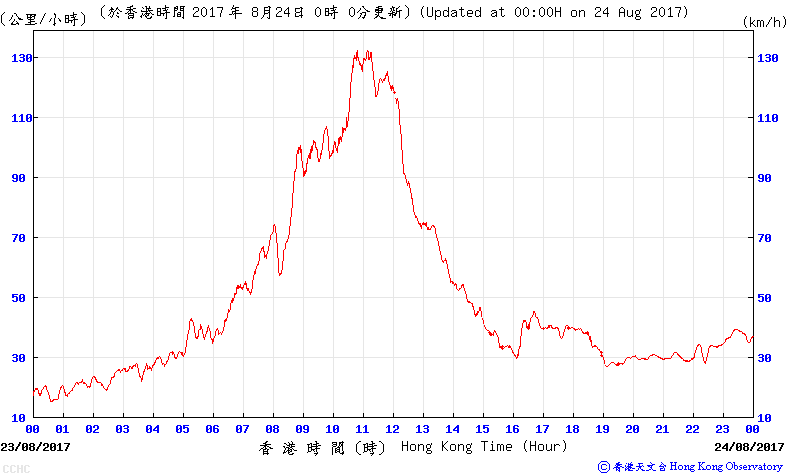 Figure 11 - Maximum gusts over Hong Kong between 10:50 and 11:00 am August 23. The threshold for hurricane force winds is 118 km/h. 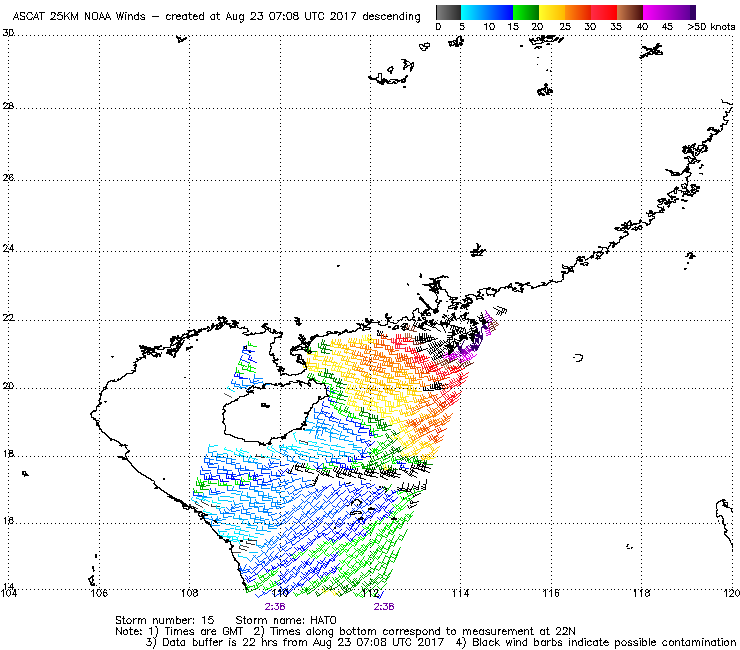 Figure 13 - Estimated wind field at 11 am August 23. 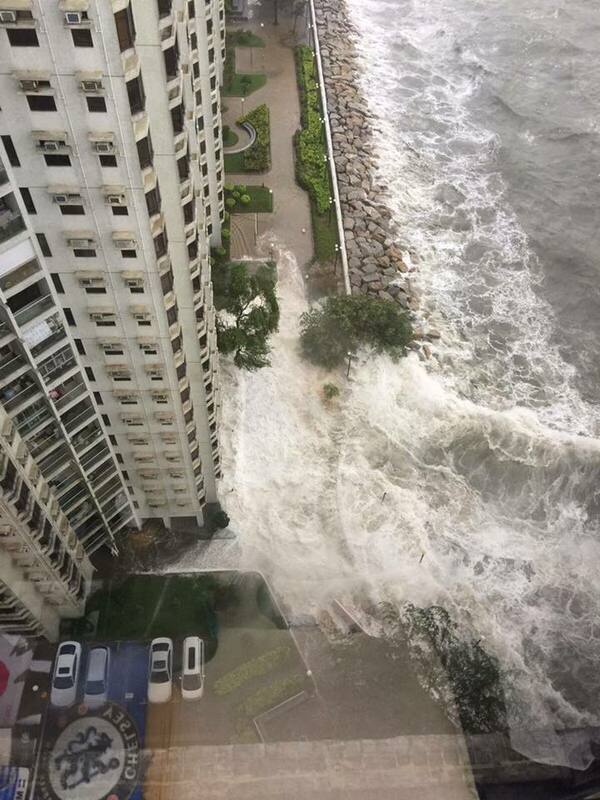 Hurricane force winds were affecting southwestern Hong Kong. 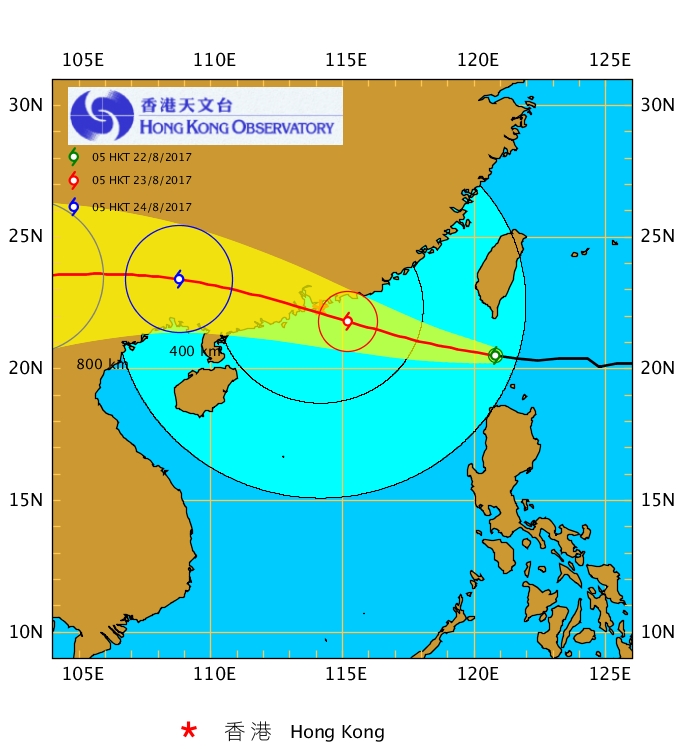 Figure 14 - HKO's track and wind radii estimates at 11 am August 23. The estimated hurricane force wind radius was 45 nautical miles (83 km). *The old wind station on the rooftop of Tap Mun Police Post is replaced by the new Tap Mun station on July 6, 2017.